Click picture to enlarge! I love the little feathers on his leg. Is Mr. Webber, by any chance, a professional photographer? He gets some phenominal shots. Thanks for sharing this one. This is priceless. 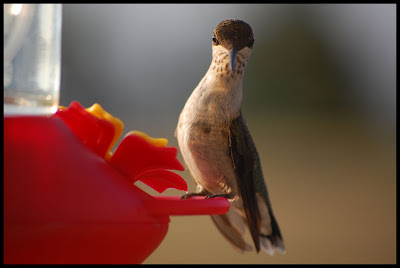 Such an expression on the little Hummer. Have a great weekend. I like to call this hummingbird the "librarian." Doesn't it just have that look? Linda, no, Mr. W isn't a professional, though I bet he's really happy you think so. He is gorgeous. Was it taken outdoors? Love the pose that pretty bird is striking! Dru, the feeder is mounted on the kitchen window. Mr. W was inside, shooting through the glass. He had so many great shots it was hard to choose from all the pics! Heather, he does look like he's posing! LOL.